The Jewish identity politics, brilliantly dissected by Gilad Atzmon in The Wandering Who? as well as in several other of his writings includes the propensity to aggregate into “Jews only” enclaves, a phenomenon visible in activism for human rights. If the formation of ethnically exclusive cells, separate from non-members of the tribe, while in their midst, is a conscious political strategy to influence and ultimately control any activity that touches upon Israel, it is also more than that. It could also be seen as a group psychological reflex. I propose applying to it the analytic method of a revered Jewish thinker, the great psychoanalytic mythologizer Sigmund Freud and explore its subsconscious symbolism. What can shtetls, walls (great and small) and eruvs represent? What would Freud’s dream interpretation method say they symbolize? Freud might well have seen this reflex as a neurotic nostalgia for the lost paradise of the intra-uterine life. Everything ex utero is seen as potentially inimical, untrustworthy, unknown and alien. The lost uterine paradise meant being safe from the hostile world, protected, effortlessly nourished, immune and even able to kick with impunity. 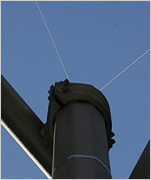 “An eruv (pronounced: AY’roov) (Hebrew: ‫עירוב‬ mixture, also transliterated as eiruv or erub, plural: eruvin (pronounced: AY’roo’VEEN) is a ritual enclosure that some communities construct in their neighborhoods as a way to permit Jewish residents or visitors to transfer objects from one domain type to another, such as carrying an object from indoors (a private domain) to a public street (a public domain) on Shabbat, which they would otherwise understand to be prohibited by Jewish law (Halakha). An eruv accomplishes this by integrating a number of private and public properties into one larger private domain. A neurotic obsession to ritually enact a symbolic return to intra-uterine life can be problematic for an individual. For an entire community it has tragic consequences, not only for itself but for its implacably “alien” neighbors. The Jewish “right of return” is itself a manifestation of the same demented neurosis, with Palestine posited as the imaginary tribal womb. Zionists claimed that by taking over Palestine and inventing “Israel,” they were going to make Jews “a people like other people,” an impossibility given the method chosen: feeding the delusion and validating the pasychosis. A cure far worse than the disease. The proper cure could only be an en masse moral, ethical and psychological Caesarian section.